Basic health checks should be done regularly so that you can spot any illness or injury quickly to give a better chance of recovery. Always check your guinea pigs droppings and demenour when you introduce a medicine, new food or new member of the group. If there is a bad reaction or a problem then the cause needs to be removed quickly. - Heaving Hiccups: Appear to be heaving from down below the diaphragm and they stop abruptly with a little cough. Guinea pigs cannot vomit and so this is happens when they swallow food the wrong way! and congeal into a ball. In this case the pellets will need to be expelled daily by the owner. Most common in boars. this however sometimes the hair will return naturally. - Barbering: When guinea pigs chew their own or each others hair. They do not seem to suffer from hairballs. Remember, not all vets know about guinea pig care and therefore great care needs to be taken when choosing a suitable vet. 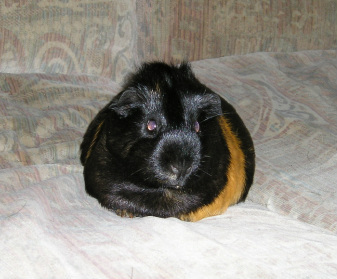 The Cambridge Cavy Trust in Cambridge is a good source for health care advise and help on any aspect of piggy care.